U.S. Eyes $60 Billion In Defense Sales To Saudis The Obama administration is finalizing plans to sell $60 billion in fighter jets and helicopters to the Saudis over the next several years. The deal could change the military balance in the Middle East, and it also will help some balance sheets in the U.S. defense industry. The Obama administration is finalizing plans to sell $60 billion in fighter jets and helicopters to Saudi Arabia over the next several years. The deal could change the military balance in the Middle East, and it also will help some balance sheets in the U.S. defense industry. A senior defense official says the proposed arms deal is more than seven times bigger than past deals with the Saudis. The driving force behind the deal, the official says, is Iran, and the threat that country's leadership poses to the Persian Gulf region. But as defense analyst Loren Thompson points out, American jobs are also a big factor. "This transaction is going to be very welcome with the U.S. defense industry because it's been facing softening demand at home for weapons," says Thompson, who is with the Lexington Institute, a public policy think tank. Defense Secretary Robert Gates is pressing for cuts in the defense budget, as much as $100 billion over the next five years. Some analysts say that's only a start. So for some defense giants like Boeing, Thompson says, it's important to look to the overseas market. Boeing was shut out in competition to build the next fighters for the U.S. Air Force. "The biggest winner in this transaction is Boeing, which will be selling both fighters and attack helicopters to the Saudis," Thompson says. 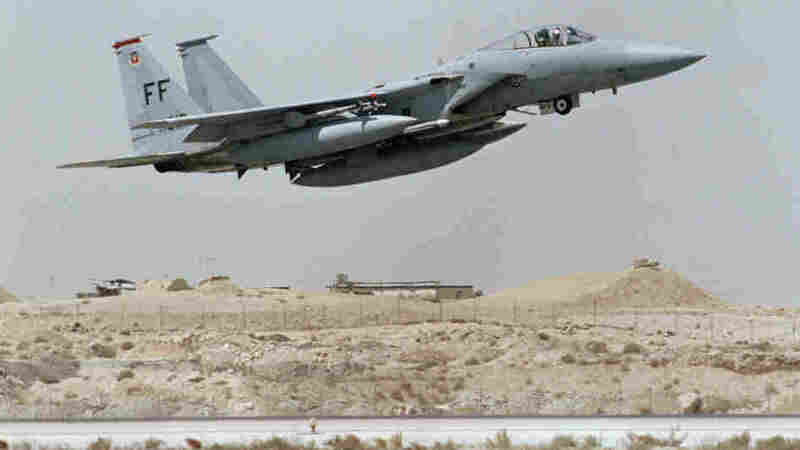 The Saudi shopping list includes more than 150 new and upgraded F-15s fighter jets, built by Boeing. The Saudis are also on the market for dozens of helicopters. Boeing builds the Apache attack helicopter and another type known as the Little Bird. Boeing declined to talk about the proposed deal, since Congress has yet to be formally notified. But a senior defense official said the company believes some 77,000 jobs will be involved. A mix of new jobs and current jobs would be retained if the Saudi deal goes through. Building the aircraft could mean jobs for a decade. That's good news for places such as St. Louis, where parts for the F-15 are made. A spokesman for Sen. Christopher Bond, a Missouri Republican, says the proposed Saudi deal would keep production lines open. And he also says the deal is important to the U.S. "strategic national interests in the Middle East." That's not how everyone sees it. William Hartung, an analyst at the New America Foundation who studies arms proliferation, says he thinks the deal signals "a new arms race." "Hopefully these weapons won't be used, but if nothing else, it's going to be a huge economic drain on countries which might want to invest in their domestic economies, which in some ways is a form of security," he says. And Hartung says the goal of containing Iran could backfire on the Obama administration. "I suppose it will have some effect on Iran, but it may just drive Iran to spend more money on its own military, so I don't see a net gain on security coming out of this," he says. There is even more money being spent on American arms in the region. Israel plans on buying a more advanced American warplane -- the F-35 Joint Strike Fighter. The aircraft should arrive in Israel about the time Saudi Arabia gets its new F-15s, if the Saudi deal goes through. But the proposed $60 billion Saudi aircraft purchase is only the beginning. There could be tens of billions of dollars more in sales. That's because the kingdom also is in talks with the U.S. about beefing up its missile defense capabilities and its naval forces. Thompson says the Saudis want to upgrade their fleet of warships and aircraft in the Persian Gulf region. "They have been putting together a program called the Eastern Fleet Modernization program that will probably buy a next-generation warship, air defense radars and missiles and probably helicopters also to patrol opposite the border with Iran," he explains. That next-generation warship is a small, high-speed ship that can operate close to shore. The Saudis already are eyeing it -- even though the U.S. Navy hasn't even ordered one for itself yet.